The tornado season has hit us hard again, just like last spring. This year it seems to be coming even harder. What Jesus was saying is that as the day of His coming draws nearer, natural disasters will increase. They will increase in frequency and intensity just as labor pains do—until the child is born. Tornadoes have not been listed in the Bible as one of the signs of His coming, however, it is a natural disaster just as an earthquake, and I think it can be included. In other parts of the world earthquakes are more of a problem, but here in the United States our big problem is tornadoes, hurricanes, and also flooding. But I would say that all things of this nature can be included as signs of Jesus return—especially when we see the increase of them. I don’t know how far along we are in the labor, that is, in terms of His coming, but it is clear that the frequency and intensity is increasing. Note the chart from 1950 to 2010. See the gradual increase in the number of tornadoes. Also, I believe the intensity is stronger too. 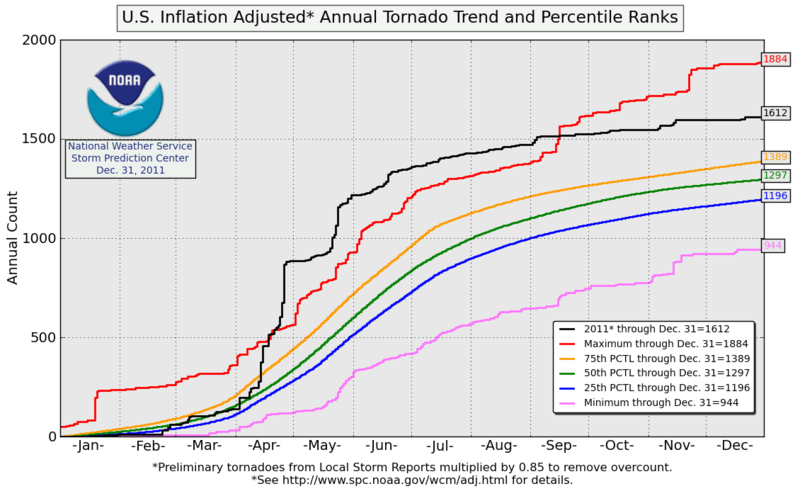 Here is the data for U. S. tornadoes for last year, 2011. Note that is is higher. If you want to read more on this subject I have two posts that I wrote last year that you may find interesting. Tornadoes: Is Not God In Control of the Weather? This entry was posted in Bible Studies, Understanding the Times and tagged Jesus' return, last days. Bookmark the permalink. Reblogged this on Studying Bible Prophecy.